The 31 Days of October event will be here before you know it! We are setting up physical events but some of our supporters have asked for a way to do a virtual social media event, so we got to work with resources! If you wish to do a virtual event, you can post some facts about IBC (from the list below) or you could share from our Stories of Hope, or pictures from our instagram, invite someone to attend an event, or even make a page on Firstgiving with a small goal of $100 Anything you do, can and will, have an impact for good! Please use the hashtag #31DaysIBC and as always, Thank You! 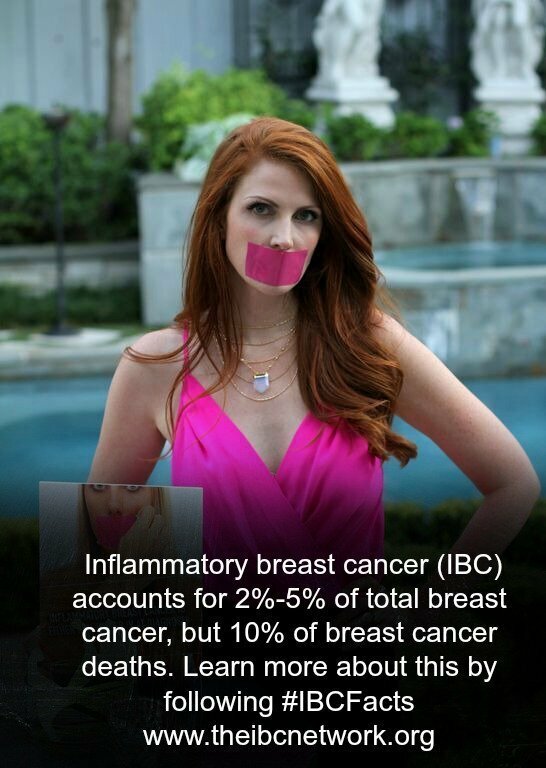 1 – Inflammatory breast cancer (IBC) – 5% of total BC incidence, but 10% of BC deaths. 2 – What is IBC? IBC is a type of aggressive breast cancer. Has outward signs, & biopsy will reveal invasive breast cancer (usually invasive ductal carcinoma). 4 – Who gets IBC? IBC doesn’t discriminate. Young/old women can get this form of breast cancer (age 20-70+). IBC can arise during/shortly after pregnancy which can be a reason for delayed diagnosis. Younger women also have denser breasts which also cause mammograms to be less sensitive. IBC doesn’t care what race you are either. Caucasian, African-American, Asian, Middle Eastern…all races are susceptible. 5 – Diagnosing IBC is difficult. This is because IBC not easy to see on a mammogram & often missed due to the lack of a defined lump and diffuse tumor clumps. Mammograms can look like this (Image). 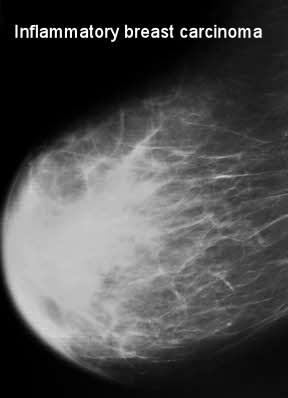 IBC skin thickening and diffuse tumor areas are more easily visualized by MRI & ultrasound than mammograms. It is possible to have a completely negative mammogram and still have IBC so do not rely on this mode of imaging alone. Only one third of women with IBC have palpable lumps. IBC can be spread out over the entire breast very quickly. 6 -Have signs of IBC? Make an appointment with your doctor promptly! IBC progresses quickly & earliest detection is at stage 3. 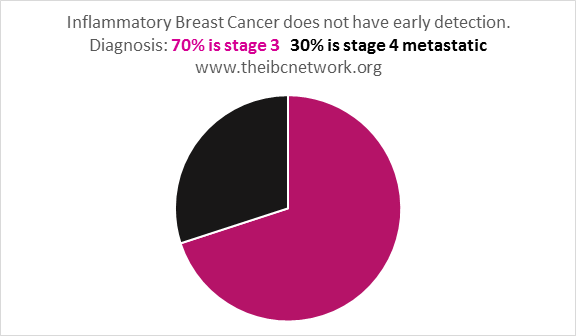 At diagnosis, 30% of IBC is already stage 4 (metastatic, usually incurable). The rest is stage 3. There is no early diagnosis possible. 8 – Several more differences from other breast cancers to be aware of: IBC breast can have shooting pains, or other physical signs. 9 – Common IBC misdiagnoses: mastitis, abscesses, reactions to bug bites. Antibiotics are often prescribed by doctors that don’t know about IBC. 10 – Do you know someone diagnosed? Share your story here why you care about IBC. 12 – IBC treatment is different from regular BC. If you are concerned, get IBC specialist attention – you’re worth it. Get the best care! There are only a few IBC specialist clinics in the world. MD Anderson was first (and is largest), opened in 2006. IBC treatment is different from other early breast cancers. The order of care is critical. Chemo 1st, Mastectomy 2nd then radiation if stage 3. Lumpectomies are not recommended in IBC. There is no lump to remove. The skin which had/has disease must be removed. Radiation is not optional. Its job is to mop-up any remaining tumor cells scattered around that the surgeon couldn’t see to remove to prevent local recurrence and therefore potential metastasis. IBC treatment is unique and called a tri-modal approach. Do you know why this is important? 13 – Stage 4 IBC treatment is personalized. 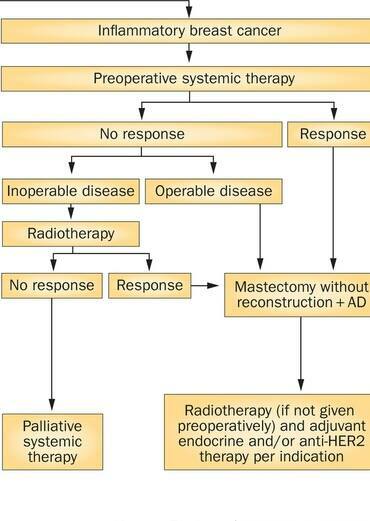 Some might not get surgery & radiation, and stay on maintenance systemic drugs forever. 15 – One reason for bad care is that IBC is not taught in medical school. Even textbooks on BC often only have a few paragraphs on IBC. Future IBC specialists learn IBC care specifics during residency/fellowship if they train at a high volume center with enough IBC pts. There are only a few such centers in the US. The issue of IBC care not being commonly taught in medical school is a challenge. 16 -Some pathological differences between IBC and other breast cancers: IBC is less often ER/PR+ vs other BCs. 40% of IBCs are HER2+. 30% = triple negative (ER, PR, HER2 negative). 17 – IBC metastatic patterns similar to other breast cancers. Bone is the most common distant site. Lung, liver and skin are also very common. Triple negative IBC recurrences, when they occur are often early events (within first 2 years). On the other hand, making it past 5 years without a recurrence doesn’t mean you’re home free in IBC. 18 – Accurate stats on IBC stages & recurrence are difficult to find. 1 reason = IBC lacks an ICD code, even in the new ICD10 system. 19 – We don’t know about any IBC-specific genetic predisposition genes. Regular breast cancer risk genes (BRCA1/2) are relevant in IBC. 20 – Family history of IBC is rare – but not impossible. Prior history of other cancers not necessary for IBC diagnosis. 21 – IBC can be a second breast cancer diagnosis even if you had a prior mastectomy. Chest wall rashes may be a sign of secondary IBC. 22 – Breastfeeding your children doesn’t seem to protect you from IBC, in contrast to some other breast cancers. 23 – Healthy diets are good for maintaining a healthy weight. Obesity is a risk factor for IBC, but not all patients diagnosed with IBC are overweight. 25 – Last few days of IBC risk factors summary: IBC like most cancers is multi-factorial. Genes, environment, behavior, luck all play a role in the etiology of this disease. 27 – While IBC is still a significant problem, there is hope. We know some 20-30 year IBC survivors! IBC is NOT an automatic death sentence anymore. 28 – Now that you’re aware of IBC, please spread the word. Help us. The IBC Network Foundation is a full-time volunteer-run charity funding research as fast as we can. And guess what? 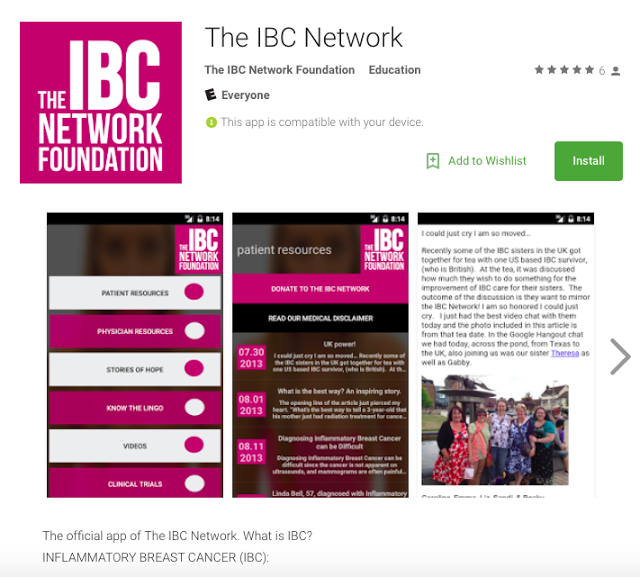 When it comes to IBC, there’s now an app for that! Our “Because Research Matters” T-SHIRTS are available! Order your t-shirt now to support IBC research.